Chicago, the city. The good and the bad, the common and the oddball. The raw and the polished. The half-remembered and the mostly forgotten. 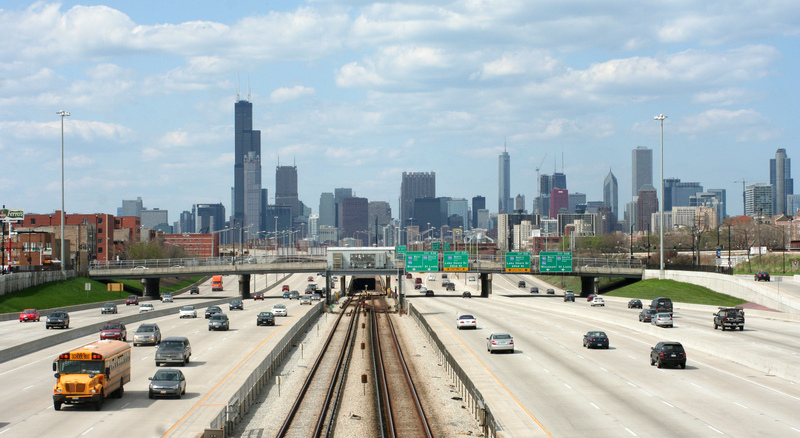 This is the Dan Ryan Expressway – I-90 / I-94 if you’re from out of town – with the Red Line CTA tracks running down the middle of it. Express lanes on the inside, locals on the outside. 14-plus lanes of concrete running north into downtown, very often jam-packed and ground to a total halt. There are a handful of places in Chicago that let you capture, in an instant, the overwhelming scale of this place. This is one of them. This monstrously huge creation, designed to funnel tens of thousands of drivers in and out of the city every hour, gives a sense of how far and wide Chicago sprawls, how much land has been overlaid with its mighty street grid. As you travel this awful highway, the beauty of the skyline beckons, ever closer till it is upon you. The highway is agony, but when you fight your way through it and disappear into that marvelous skyline, you know you’ve arrived somewhere worthwhile. May I please have permission to use this image for a non-commercial research project? my email address is seanna[dot]walsh[at]gmail[dot]com. If it is easier, you could reply to this comment. I also messaged your facebook page.